Performers include: Peyton List, Riley Smith, Devin Kelley, Anthony Ruivivar, Mekhi Phifer, Lenny Jacobson, and Daniel Bonjour. Inspired by the 2000 feature film of the same name, this sci-fi mystery drama revolves around a young woman who manages to communicate with her deceased father through time and change history. Detective Raimy Sullivan (Peyton List) has always wanted to prove that she is nothing like her father. When Raimy was eight years old, NYPD Officer Frank Sullivan (Riley Smith) left Raimy and her mother, Julie (Devin Kelley), to go deep undercover and ended up getting killed — or so she’s always been told. Few people knew about the secret undercover sting operation that Frank was really charged with, led by Stan Moreno (Anthony Ruivivar). He’s now the Deputy Chief of Police. Frank’s former partner, Lieutenant Satch Reyna (Mekhi Phifer), has become Raimy’s mentor and friend. He has urged her to let go of the hurt and anger she still feels about her father’s disappearance and death, but the old pain still lingers. Raimy can barely bring herself to discuss Frank, even with her devoted boyfriend, Daniel (Daniel Bonjour), or her childhood friend, Gordo (Lenny Jacobson). Now, 20 years later, Raimy is stunned when a voice suddenly crackles through her father’s old, long-broken ham radio. It’s Frank, somehow transmitting over the airwaves and through the decades from 1996. Both father and daughter are shocked and confused by this communication, but Raimy shakes Frank to the core when she warns him that the secret sting he is undertaking will lead to his death. Armed with that knowledge, Frank survives the attempt on his life. But changing history has dramatically affected Raimy’s life in the present – and there are tragic consequences. Separated by 20 years, father and daughter have reunited on a frequency only they can hear. Can they rewrite the story of their lives without risking everyone else they love? First aired: January 25, 2017. What do you think? 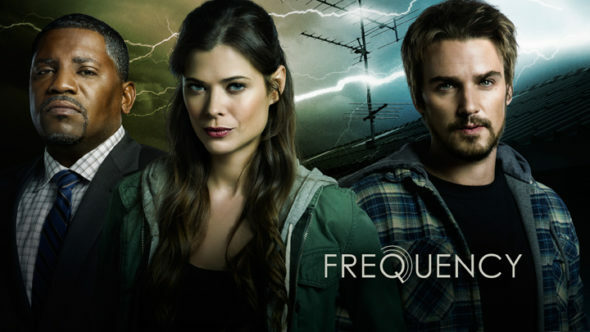 Do you like the Frequency TV show? Do you think it should have been cancelled or renewed for a second season? I loved this show! I was hooked from the first episode!! I don’t think it should’ve been cancelled at all! Loved the show wished they would renew it for many seasons to come! The actors were great story line good and I loved how changing the past then recharged the future very realistic!